Becoming the next great Android game developer takes more than just luck. If you want to make the next great mobile game, you need to have the skills to make it. The problem is, there aren’t many courses or guides or “BEGIN HERE” sets of instructions to get you going – you have to go out, find it all on your own, and hope you made the right decisions on courses. Thankfully, the current Android Game Developer Bundle we have on-sale in the DL Deals shop is here to help take the pain (and price) out of the entire process. 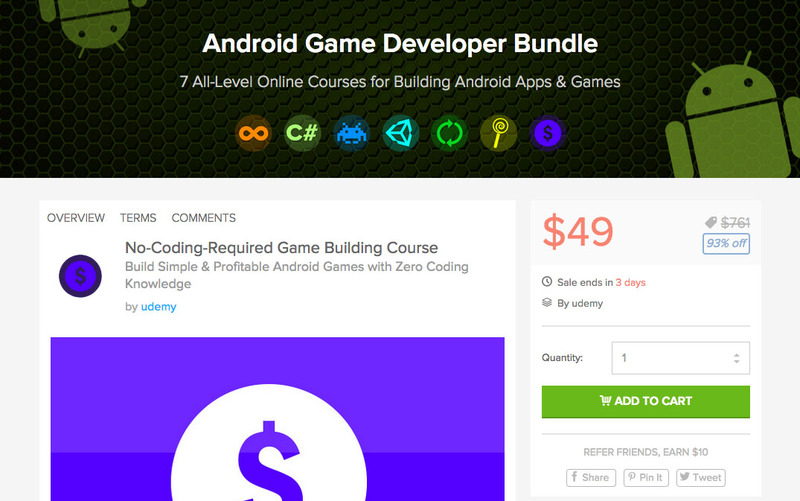 For just $49 (with a value well over $700), you can get into Android game development in a hurry. From an Android Lollipop Dev Course (118 lectures) to 2D Game Developing with Unity3D (20 lectures) to an All-Level Android App Development Course (32 lectures) to earning income with your games (49 lectures), you have a course put together to help anyone kickstart their development carrier. Overall, you have seven courses in the bundle, though you only have three days left to get them all at $49.